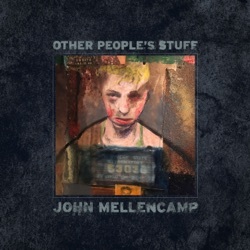 Other People's Stuff is the fourth compilation album by John Mellencamp, released by Republic Records through UMG Recordings on December 7, 2018. Not everything on Other People's Stuff is politically charged -- Robert Johnson's "Stones in My Passway" is merely haunted, for instance -- but taken as a whole, the album can be read as a summation of what Mellencamp loves about America, which amounts to a political statement in 2018. Overall, John Mellencamp delivers on his new album, Other People's Stuff. He is able to breathe fresh life into these recordings, as he dusts them off and gives them his a distinct musical makeover. Given the potency of Mellencamp’s post-millennium output, you would think that he’d want to put his road-worn voice fully on display for all to see, rather than giving them a disparate, repackaged glimpse of (mostly) years gone by. Despite the nature of the anthology, Other People’s Stuff is cohesive; these are songs that fit one another perfectly, all individual pieces of the great American songbook belonging to Mr. Mellencamp. Thirty years into his career, Mellencamp still manages to bring something exciting to the heartland rock template. Fancying himself as a folk singer in the populist tradition—think Dylan, Springsteen, Pete Seeger and Woody Guthrie—he tackles these tunes with a gritty, rough hewn sensibility that reflects both his passion and purpose. Lazy All songs he's released b4 at some point. At least put out a new album of cover versions.